A scale generated barcode, is a barcode that is printed by a scale. The barcode itself contain the number for the item (barcode of item) and the weight or price. To use scale generated barcodes, go to ROBOTILL Manager > Setup > System Configuration > Retail Specific > General Retail Settings. Check 'Enable Scale Generated Barcodes' and enter the position of the code for the item. 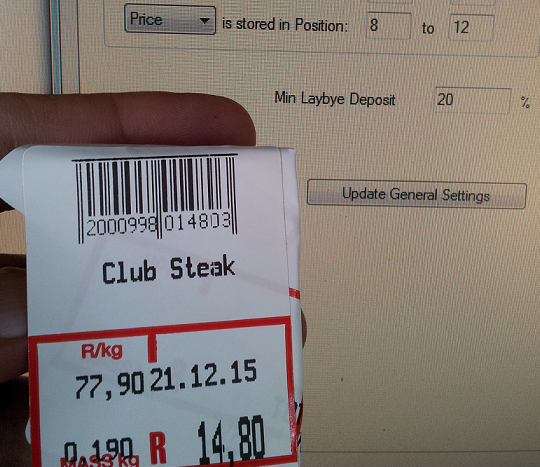 If you have a butchery that sell club steak at R 77.90 per KG, you can either let the scale add the price or the weight in the barcode. For this example we will let the scale add the price. The barcode for the item itself (product code) is 00099 and is in position 2 to 6. The Price is in position 8 to 12 (14.80). The number actually start at position 9, but a bigger number can start at position 8. We first setup the scale and that is done in ROBOTILL Manager > Setup > System Configuration > Retail Specific > General Retail Settings. The scale setup is done once for all products. Remember that changes in setup are only loaded during start up, so you will have to restart the POS Application for these changes to take effect. We now just need to add the actual stock item. 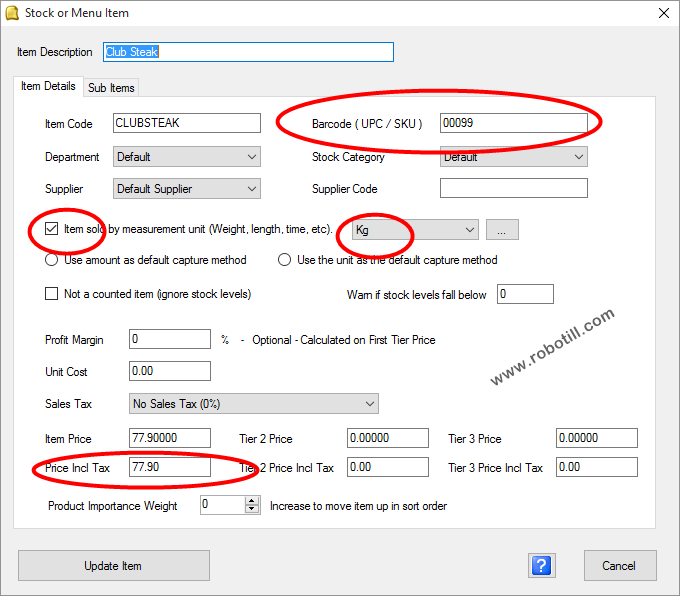 In Manager go to 'Menu and Stock Items' and add the item. Note that you do not enter the full barcode as it will change each time it is printed, you only add the item barcode that will be printed within the barcode. For this example it will be 00099. You also need to specify the price per KG (or any other unit that you use) so that the correct quantity or price can be calculated. That is it! When the barcode is scanned, ROBOTILL will find the item barcode and the price within the barcode. The quantity will be calculated from the price (or the price from the quantity if that was selected).